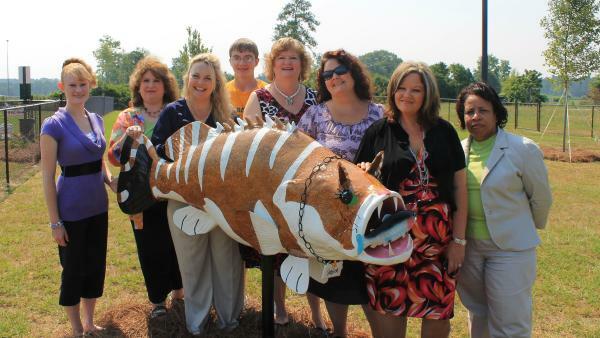 The Halifax County Convention & Visitors Bureau released another Roanoke Valley rockfish at the Halifax County Visitors Center Dog Run to welcome furry, four-legged visitors to the area. “Catfish,” designed and painted by artist Leary Davis, is every dog’s dream, a fat feline fish carrying a small fish in its mouth. Dog Run visitors give it two paws up! “With the steadily growing trend of people traveling with their pets, dogs especially, and our proximity to I-95, it was a natural fit for the Halifax County Visitors Center to open a dog run,” said Lori Medlin, President/CEO of the Halifax County CVB. “‘Catfish’ is a fun addition to the Visitors Center Dog Run, which we want to be a welcoming and relaxing place for travelers and their dogs.” The dog run features separate areas for large and small dogs. There is a fresh water source and metal bowls for use while at the dog run. Baggies and a waste receptacle are provided for owners to clean up after their dogs. There are also picnic tables where visitors can eat and relax while watching their dogs play. The rules of the dog run are posted to help ensure that all owners and pets are safe and that the use of the dog run is a pleasurable and clean experience. For more information about the Dog Run, Halifax County Visitors Center, attractions and events in the area, visit the website or give us a call.